Cedric Tremblay-Fournier signs with Moment skis! Moment Skis is proud to announce the signing of Cedric Tremblay-Fournier to their Pro Team. The decision to sponsor Cedric took place over the weekend, &ldquo;We are extremely happy to have Cedric become a part of the Moment family&rdquo; Said Moment Skis Team Manager Jason Badgley &ldquo;He is an excellent skier, and brings much to the table. Cedric is an experienced and talented athlete.&rdquo; Cedric, residing in Trois-rivi&egrave;res Qu&eacute;bec has been filming with&nbsp;Rage when they were on a trip in Qu&eacute;bec and is looking forward to film again with them. Ced also plans on entering several competitions during the 07/08 ski season including the WSI, part of the annual Telus World Ski and Snowboard Festival in Whistler, British Columbia. &ldquo;To say the least, I'm really excited to be with Moment and I'm expecting great things in the future for the company as they seems to care a lot about what the riders have to say and&nbsp;are pretty open minded about the way they design their skis.&rdquo; Said Cedric, when asked how he felt about joining Moment Skis. 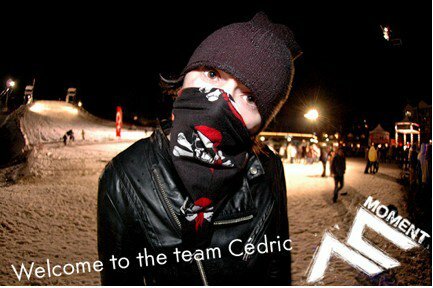 In addition to Moment, Cedric is riding for Bula, Spy optic, JIBIJ, and DNA outerwear during the 07/08 season. Moment Skis is a Reno-based ski engineering and production company dedicated to generating a more fun approach to the business and production side of skiing. They are a group of passionate out-of-the-box- thinking skiers, engineers, one mason and contemporary artist committed to putting the fun back in the ski industry. The end result is a ski company serving 13 unique skis covered with eccentric art to change a traditional ski culture.